Trying to make the Change. 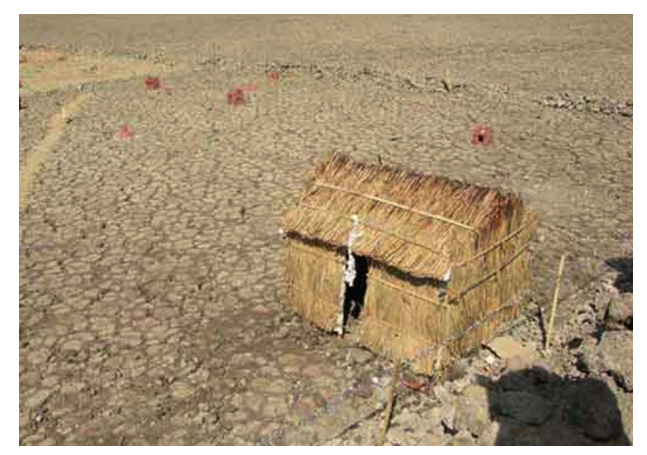 “This is an ongoing project undertaken between Ganatar and IDEAL in the Little Rann of Kutch. The project targets the Agariya community. Its focus is the economic betterment of the women and children of the salt pan workers. The project enters its fourth year now and the results are just beginning to show. The Agariyas are people living in absolute poverty deprivation and isolation, in a land of near nothingness, where the birds don’t fly and grass doesn’t grow, where the water doesn’t flow and salinity turns the bones into rock…. Situated in the Desert, the Rann of Kutch in North West India, the children of the salt pan workers migrate annually to the unforgiving land to produce table salt in similarly unforgiving circumstances. Since they have no formal schools to attend, they miss out on schooling for eight months a year. Families own small pans from which they harvest salt. The conditions in which the Agariyas are forced to work are far from comfortable. They work in the relentless heat; most of them are not given the protective footwear needed to protect their bodies from absorbing too much salt. The condition is so serious that upon cremation, while the rest of the body burns up naturally, the feet stay undestroyed due to the high levels of salt in the body. Apart from this, is the situation of a low pay and high debts. The salt pan workers work eight to ten hours a day. They have to clean out the salt pans, fill them with sea water or the natural underground saline water, scrape away the salt and finally collect the white salt crystals for transportation elsewhere. They earn roughly around seven paise per kilo of salt. And they make roughly about three thousand rupees a year. Besides eye and skin problems, these people, , suffer from malaria, fever and malnutrition as basic health amenities are not in place here. The workers have no access to sanitation, potable water and medical facilities. Even if they get a permanent structure as shelter, it is small and badly ventilated. Children from such families also miss out on school life as they are in the salt pan from September to May and can go back to their villages only in the monsoon months when there is no work. The Charitable Trust set up in Ahmedabad under the Bombay Trust Act, under the name of Foundation for Art and Craft Expression, FACE was established in 2003.
with a special emphasis on New Age media like the study of Glass/ Wood/Fabric/ Metal. 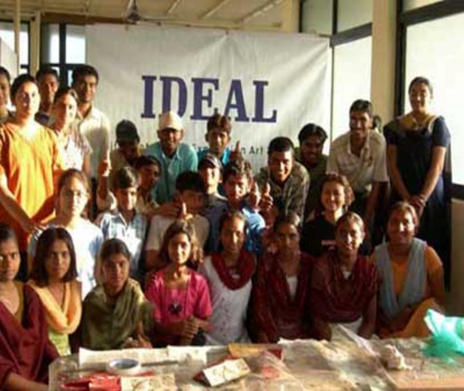 Towards this end the Institute of Design Expression ,Art and Learning, IDEAL was set up in 2003 under aegis of the Trust. Ganatar, an NGO which is involved with the Agariya community in the Little Rann of Kutch, was identified as the partner in the social service progamme. Ganatar’s thoughts and ideologies matched to some extent with those of the Idealists. 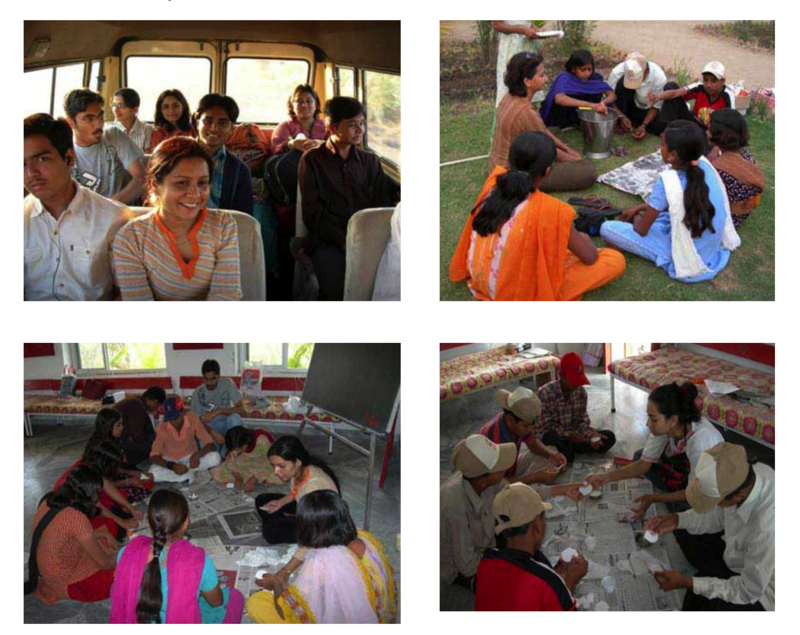 Ganatar aimed at providing a basic education to the children of the salt pan workers with a view to their upliftment. “The Idealists believe that education without vocation was to some extent self defeating. Only if vocation was provided, would education be relevant. The people, women and children had to be shown the link and shown its direct economic benefit. 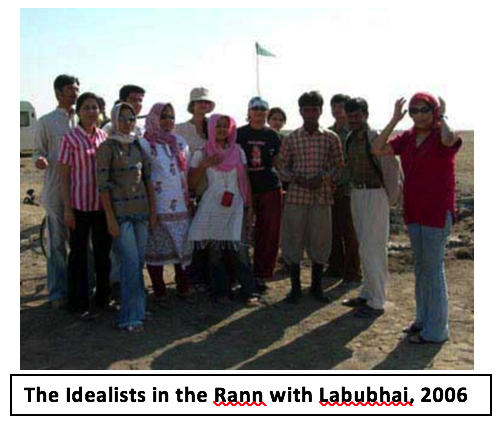 Educating the children and then sending them back to their life in the Rann was only going to create an awareness of what they were missing. And leave them educated but frustrated. The Idealists were aware of the potential of high end quality products in the consumer markets. And they knew how to reach them. They also had the ability to train small groups of women and children in simple creative work, which would then be translated into high end products and marketed. So the project Liberation, as it was called, began. them to what is now the campus. And the training camps began. The children were found to be wonderfully creative! Coming from a land without color their work was rich with color!! This was 2003. A terribly hot, sweltering summer that no one felt! And we knew we were on the right track. The children began to wait for these camps. The women began to plan their days so they could attend them – and we were on our way. Small triumphs in the form of small orders, small exhibition counters and sales beyond their wildest dreams followed, and the idea of education with vocation was affirmed. The work force was now living on campus.Ganatar was providing a wonderful education. Practical knowledge of living, hygiene, housekeeping, cooking with out any gender bias was being imparted. In the logo of the Agariyas, the line symbolises the flat, endless horizon and the red bindu symbolizes the rising sun. 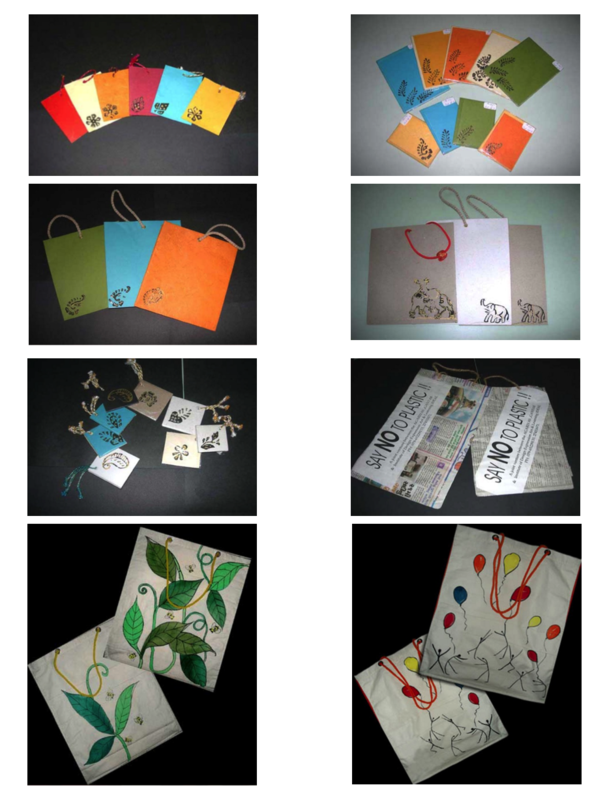 The first product line to launch under the Agariyas brand was the line in Paper. Stationery, bags, Boxes, bookmarks, cards, notes, etc. Each beautifully crafted and designed. Various techniques like marbling, block printing, hand painting, screen printing and dyeing are applied. The children are taught not to rely on a charity angle for their sales. They are taught to rely on design, quality and finish. They are taken on field trips to the city and are made aware of the big departmental stores and malls that will one day carry their products. They are taught to look and examine the products that are displayed. And are shown the quality they are expected to produce. And hopefully better. They are being taught the value of the brand “Agariyas”. The line has met with some small measure of success. The company was launched in July end, targeting the Rakshabandhan festival in Ahmedabad. The Agariyas entered exhibitions at “The Pride” and the “Grand Bhagwati” hotels. The children attended to the customers and made their sales under the watchful eyes of the Idealists. And children whose families earn Rs 3000/ a year under terrible conditions saw their potential to double that in a single evening . It was an uplifting moment for all of us. Economic success was understood. Clearly. 2006 November – Orders have been executed for private clients for Diwali greeting cards, letterheads, gift bags for art stores, and for corporates like Cotmac, Control Plus, Citibank. And we are on our way. The group will expand and the momentum will pick up. The second product line to launch will be the line in Fabrics. We are hoping to launch a line of Home furnishings, table linen etc. A line in ladies wear, basic shirts and work wear is on the anvil next.